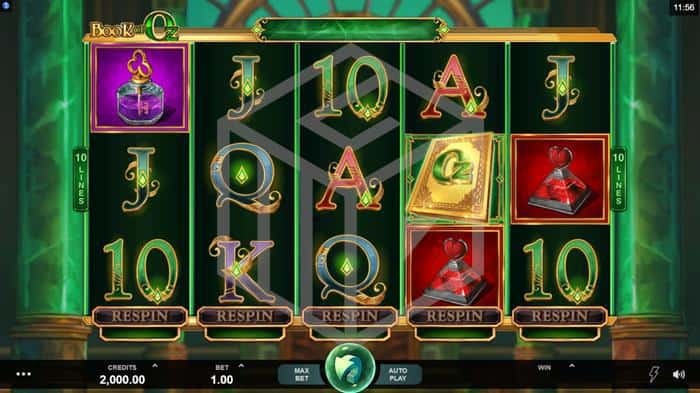 Book of Oz was released on 11th December 2018 by Microgaming in partnership with Triple Edge Studios and adds a new theme and an innovative twist to make this slot stand out from the myriad of other Book of Ra Clones. With a theme loosely based on the Wizard of Oz, Book of Oz is a 5x3 reel high variance slot with 10 fixed pay lines and can be played from €0.10 up to €25 a spin. Book of Oz benefits from re-triggerable free spins and a unique respin feature and has a maximum win of 5000x the bet size. Although Book of Oz takes place in the mythical Emerald City in the Land of Oz rather than at the foot of a pyramid or Egyptian temple like most ‘Book’ slots, the design certainly has its similarities. Rather than sitting between golden columns at the entrance of an Egyptian shrine, the game board here sits between two emerald columns somewhere in Emerald city. Low symbols as per your regular Book slot are the 10-A royals, will the higher paying symbols include the potion of love, a key in a purple potion, the lion of courage and the highest paying, the mystical wizard who pays 500x the stake for 5 on a pay line. As is the “Book” slot way, the scatter and the wild are the same symbol, the Book of Oz of course, and landing 5 scatters will also earn you 200x the stake before you even enter the bonus round. 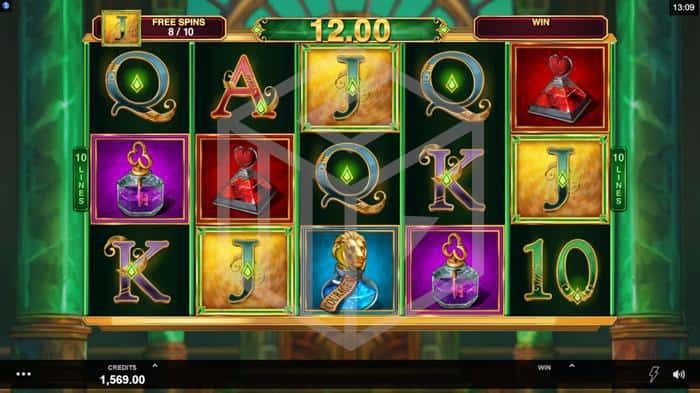 All the symbols are beautifully hand-painted and fit well with this fantasy-themed slot. As well as the free spin round Book of Oz really sets itself apart with a permanently on offer base game individual reel respin feature. At the end of every base game spin you can, if you choose to pay the associated price, respin any of the reels as many times as you like although only one at a time and each respin costs you money. The amount of money each spin costs is shown at the bottom of each reel and the cost is linked to how valuable a respin may potentially be. For example, if you have two scatter symbols on the reels already then the cost to respin a reel in the hope of getting that 3rd scatter is likely to be quite high as the potential reward is so great. As with your average high volatility slot, players will be relying on landing those Books to enter the free spin round if they want to make some real money. Landing 3 will see you enter the bonus round with 10 free spins but if you manage to land 4 or 5 you’ll be rewarded with 12 or 25 free spins respectively. Anyone familiar with these slots will know that before the spins start one of the standard symbols will be chosen to act as a “Special Symbol” which will expand to cover the entire reel if enough land to trigger a win, although with the special symbol they don’t necessarily have to land on adjacent reels. For example, if your special symbol is the Q then as long as 3 Q’s land on 3 separate reels they will all expand and you’ll be paid as if you have landed a 3x3 block of Q’s. The minimum to activate the expanding reels are 2 for the premium symbols and 3 for the lower value symbols. During the bonus round if you manage to land 5 of the highest value symbols on the 5 reels then you’ll hit the maximum win of 5,000x the bet size. 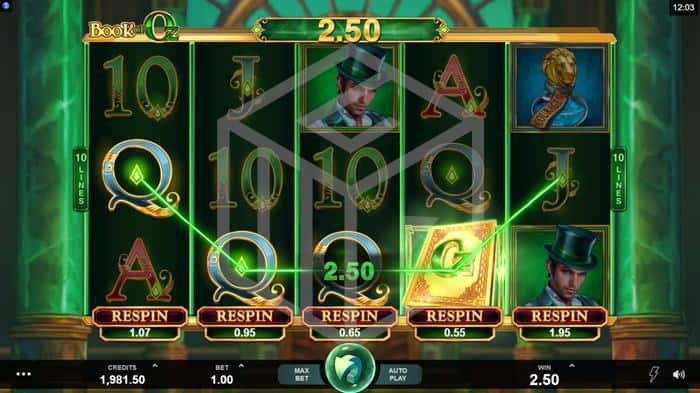 Free spins can be retriggered by landing another three Books of Adventure, and you are considerably more likely to land three of those beauties during the free spin round than during regular play. It’s good to see a developer add something new to infinitely tried and tested Book clone slot. By adding the innovative respin option to every spin Microgaming has opened up an entirely new strategy option for players. It offers an exciting new challenge to players who can try to work out the reward/risk ratio of paying to spin individual reels. Also, the chance of winning 25 free spins on such a high volatility slot is a nice touch as most clones only offer 10 plus retriggers. The design and theme work well, another nice step away from the ancient Egypt clones. Playing Book of Oz was like driving a comfortable, familiar car and then finding out someone’s added an extra 50hp to the engine – great fun!